Another beautifully restored bay window bus, spotted a year ago in Berlin. Looks like a brand new paint job. Nice light green, but not sure which color this is, or if it is an original VW color at all (Sand green, L311?). Extra indicators on the roof in the rear, usually more common on ex-ambulance buses. Spare wheel and rectangular additional fog lights at the front. The hub caps look like from an early bay, but front indicators and rear lights are clearly late bay, so the bus should be from 1973 or younger. The indicator switches at the steering wheel suggest early late bay, and the little door covering the fuel filler cap was apparently build between 8/71 and 7/73, so I guess it will be from 1973. 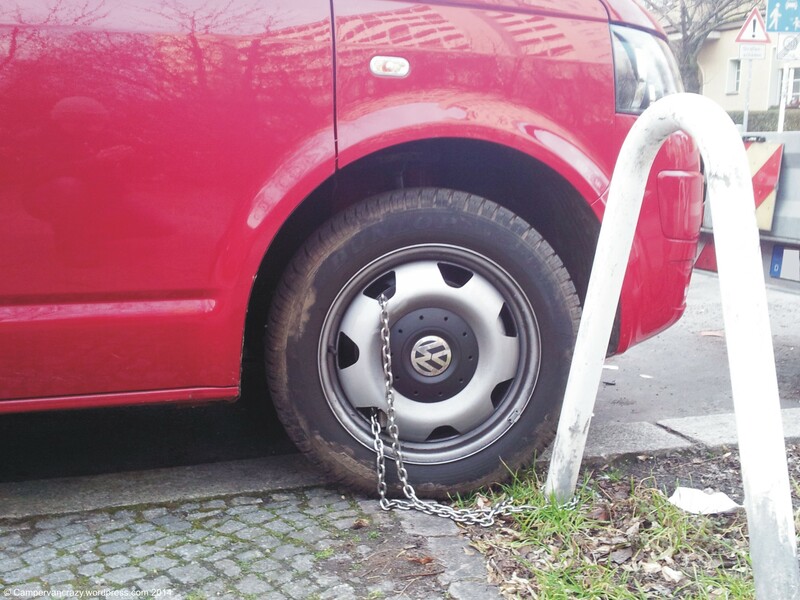 Wheel clamp and steering wheel lock as theft protection. I had stopped to take some photos and was so focused on the bus that I did not even notice the BMW 2002 next to it. Had to go back and take one more photo when DrJ pointed it out to me. 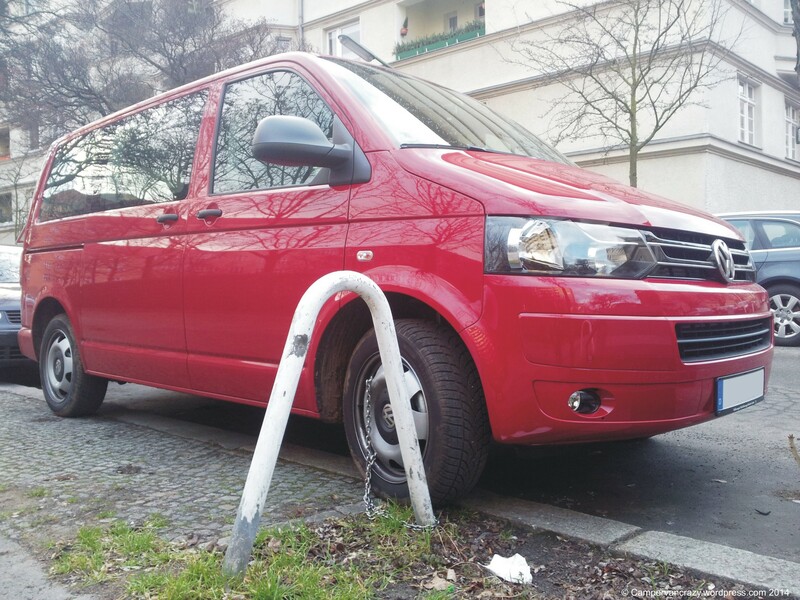 Beautiful and probably brand new Volkswagen T5 Multivan, spotted last winter in Berlin, with down-to-earth no-nonsense anti-theft protection: Wheel clamp on the rear left wheel, and the front right wheel chained like a bicycle to a street tree guard. 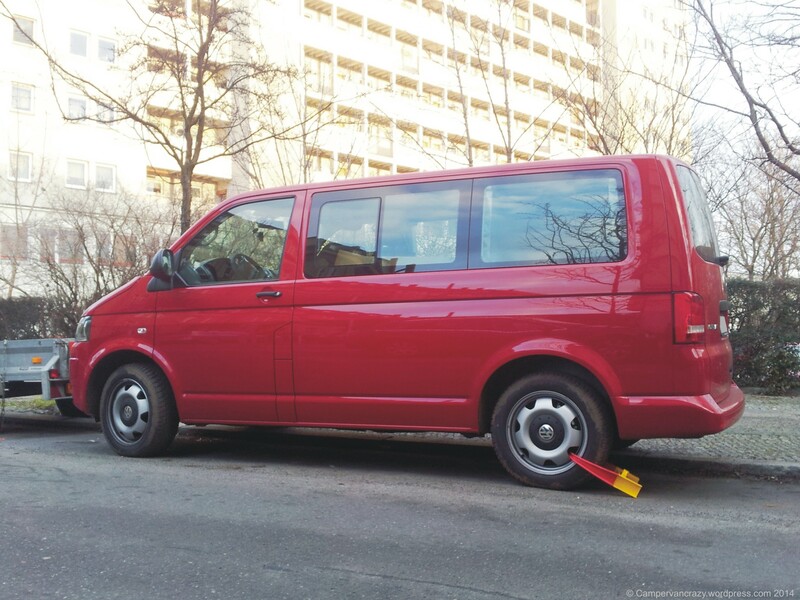 New VW buses make it into the top-ten of most stolen cars in Germany every year, and Berlin has the highest rate of stolen cars (per number of insured vehicles) of any German city. So probably not a bad idea if you have to park your precious van on the street. 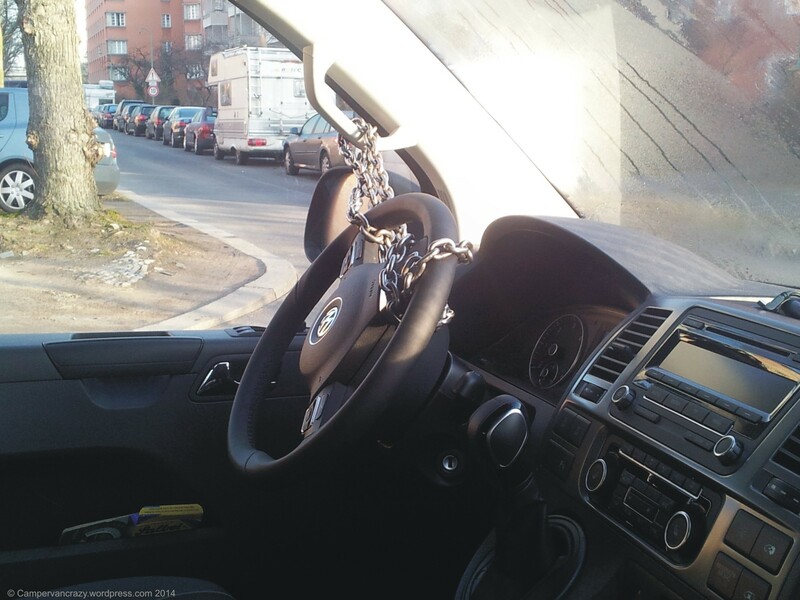 Nice re-use of the chain a few days later in a different spot, locking up the steering wheel to the A-pillar handhold.